Playing on Las Caletas Beach off the coast of Puerto Vallarta. 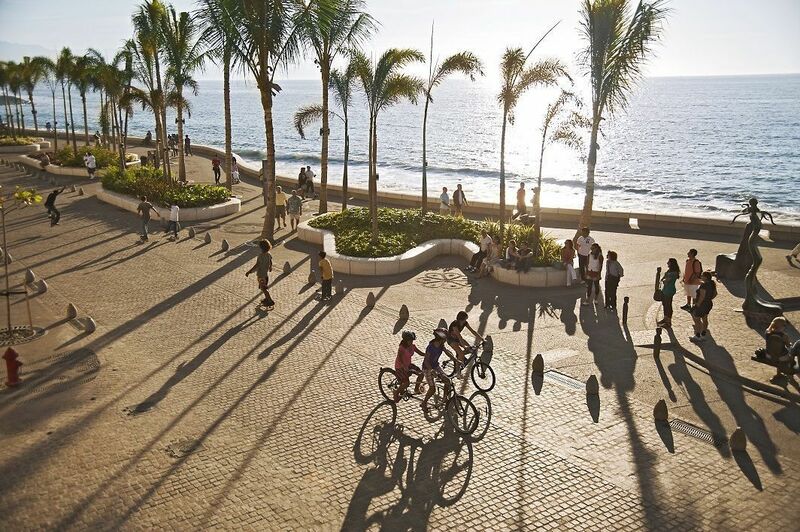 You can easily walk or bike along the paved seaside . 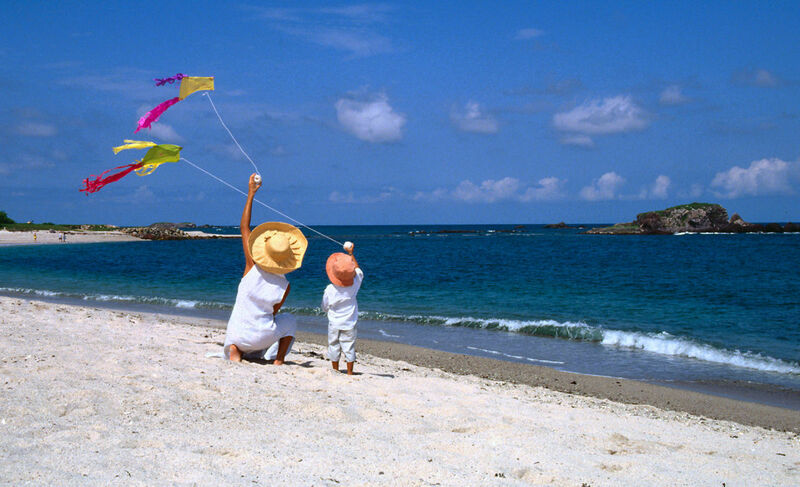 Kite playing fun along the shores of Banderas Bay. 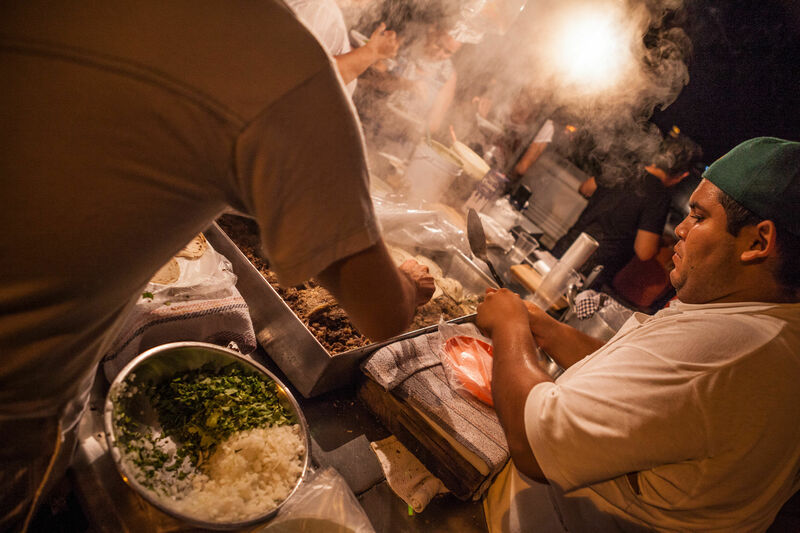 Soft tacos are a favorite local snack food. New parents looking for a stress-free, tropical beach getaway can point their browsers to the waterfront Melia Vacation Club in Puerto Vallarta, Mexico. This all-inclusive resort offers adults every amenity imaginable, including a nursery for ages 4 months to 4 years, so parents and grandparents can enjoy themselves knowing baby is having fun, too. An all-inclusive package means that all guests are given a variety of dining options and recreational activities, most at no additional charge. There’s always equipment and a coach available, whether you’re trying the shooting range, archery, tennis, ping-pong or the pool tables. The gold sand beach overlooking Puerto Vallarta’s beautiful, warm and calm Bay of Banderas is the place to join lessons in beach volleyball, water polo, and ocean kayaking. More mellow fitness activities include water aerobics at the pool and yoga. A variety of nightly shows are available in the Melia Theater, changing so often that you’ll never see the same one twice. Afterwards, tune into the Live or D.J music to dance, sing your heart out at Karaoke Nights, or bet a winning hand at the Casino Games at the Lobby Bar. In addition to the expansive family activities program, this large and sophisticated resort also caters to destination weddings and reunion groups, who often find that kids’ facilities come in handy as they celebrate. Of course there’s a lot that families can do together on property. There are large, airy communal spaces to play indoors and out. The serene gardens host iguanas (try to get a selfie with one when they freeze like statues), ducks, birds and ponds stocked with koi, all of which are endlessly fascinating for toddlers. There’s always a water view from restaurants and bars, so even during a tropical rain storm you can relax, playing board games, having fun together. With the Melia Vacation Club Puerto Vallarta “Kids & Co” program, children rule. Guest rooms more than 400 square-feet with two double beds and two bunk beds are conveniently located on the ground floor, and feature special amenities and exclusive benefits. There is a separate check-in desk complete with snacks and juices, and a family concierge to help you make the most of this trip. The beloved, classic cartoon “Yabba dabba do!” family — The Flintstones — serves as brand ambassadors making regular appearances through the resort. The themed Flintstones Land has a Baby Rock Club where babies and toddlers from 4 months to 4 years are cared for by certified babysitters with Red Cross 1st Aid training. Custom facilities include a sleeping area, adapted bathroom, indoor playground, cribs and strollers. Play time means cartoons, puzzles, story time, and time to play with make-up and fantasy costumes. If you’re looking for private babysitting during the day or for a large event, the same certified and trained staff is available for a fee, so parents can rest easy. For kids 5 to 11-years-old, there is the Bamm Bamm Club offering innumerable indoor and outdoor activities to enhance children’s creativity. Children can partake in activities including water balloon fights, arts and crafts, pirate treasure hunts, a climbing wall, batting cage, kayak, beach and pool games. Teens ages 12-15 are not forgotten: they can take hip-hop workshops, practice karaoke, join in beach parties and try more; note that a minimum of 10 participants is required. Sound like a Getaway with Baby or the Whole Family? For more information about the resort and to book a stay, please visit the Melia Vacation Club Puerto Vallarta site . If you’re feeling lucky, enter the Puerto Vallarta Family Giveaway and you might win a getaway to this resort for a family of four. This is a blog post sponsored by the Puerto Vallarta C&VB but the opinions expressed – especially about the Flintstones – are our own.